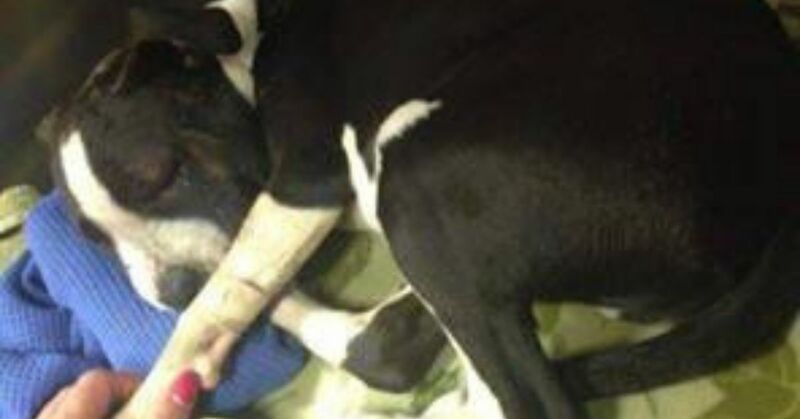 Severely injured and barely alive, a young pit bull puppy made it as far as a front porch before collapsing. Shortly afterward, the homeowner found the puppy lying on the porch and called Unleashed Pet Rescue and Adoption for immediate help. The rescuers picked up the dog and raced him to an emergency veterinarian's office, unsure if the dog would survive by the time they got there. 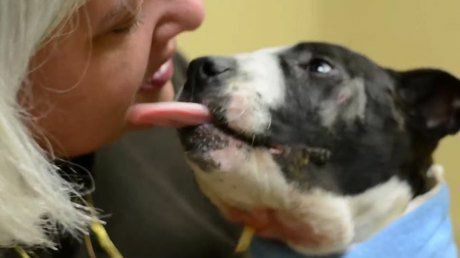 Upon further examination, the 5-month-old puppy, named Jax, had suffered horrific injuries including open wounds to his head and neck and deep gashes to his face. The puppy's face was puffed up and his eyes swollen shut. 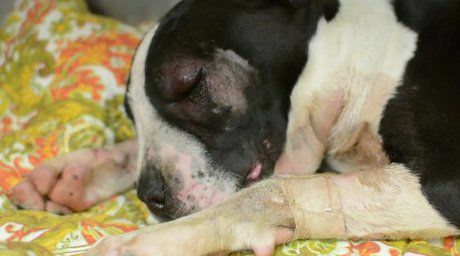 The veterinarian and the rescuers believe the injuries were consistent with those inflicted on bait dogs used for training fighting dogs. Two weeks of intensive care would be necessary for Jax's well-being, and it was possible he would not make it. Despite all he was enduring, Jax's spirit never flagged; the veterinarian, his staff and the rescue's volunteers all remarked on how even on the brink of death, Jax still wagged his tail when they were around him. His wounds were cleaned up and stitched, and then Jax faced the most significant hurdle of all: surgery. 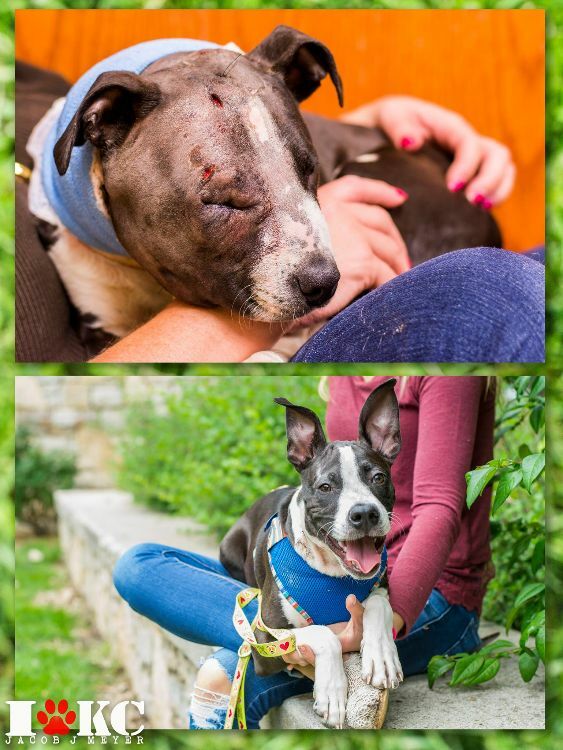 After the surgery, Unleashed Pet Rescue and Adoption announced the good news: "Jax made it out of surgery! They drained 1 1/2 cups of puss out of his head!! The area that was abscessed was from the bridge of his nose to the back of his ears and the right side of his head. He also has drainage under his jaw and tongue. He has a drain in his head right now to help get the infection out of him. He also has a soft wrap around his neck with pads to catch the drainage. "They are going to continue with the hot wraps as they said that really seemed to help a lot. His white blood cell count is up to 17,000 (from 5,000) so he's doing much better in that area, too! He now has a Fentanyl patch for pain and he will remain in ICU to ensure he gets the around-the-clock care that he needs," the rescue stated. Slowly, Jax began his road to recovery. After he was released from the intensive care unit, he was placed in a loving foster home where he flourished with the care and attention given to him. Within a month of his hospital stay, Jax looked like a completely different dog! Soon, Jax, the puppy who never gave up on life or the goodwill of people, was off to create a happy future with his new adoptive family. Jax will never have to worry about being used in a violently ever again. Unfortunately, many puppies and small dogs such as Jax are used as bait in dog fighting training and fighting rings. 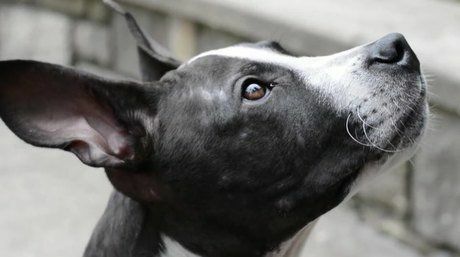 Larger dogs can also be used as bait but often have their mouths muzzled or taped shut so they are unable to fight back and injure the fighting dog. If they are not killed during training or fights, bait dogs are often killed outright or dumped and left to fend for themselves. Watch the video below for more information on Jax's recovery. Contact a local rescue to find out how you can speak out against dog fighting in your neighborhood.